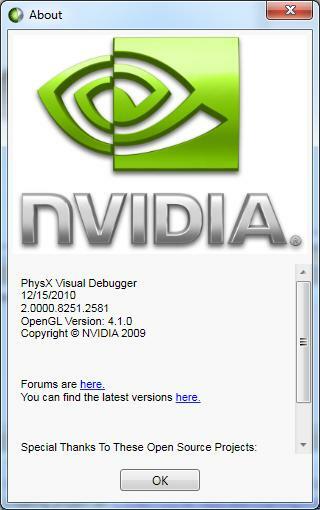 NVIDIA has release a new version of PhysX Visual Debugger (or PVD), the debugger for PhysX scenes. PVD 2.0.8 can be downloaded from PhysX Developer Support. 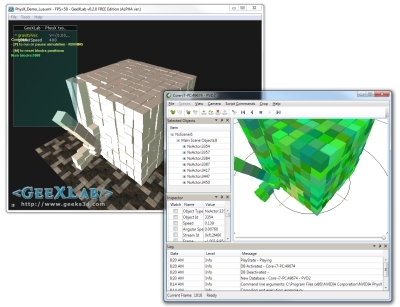 To debug a PhysX scene with PVD, the PhysX application must connect itself to PVD. You can test the PVD with GeeXLab. Just download the PhysX revolute joints demo for example, and add the HYP_PhysX.ConnectToVisualPhysXDebugger() instruction in the init script after the HYP_PhysX.StartEngine() function. Then start PVD, start GeeXLab, drop the demo in GeeXLab and you should see the PhysX scene in PVD.